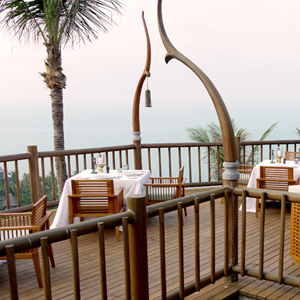 With breath taking views, Lan Tania is the Four Season Resort Koh Samui's signature restaurant. It serves everything from breakfast to evening cocktails, mixing global cuisine (primarily Italian and European) with native Thai dishes. La Tania is most beautiful at sunset, when you can see panoramic views of the resort's cost among the backdrop of Samui's painted sky. Outdoor and indoor seating is available. As this is part of a resort, guest bookings take priority, reservations are highly recommended.